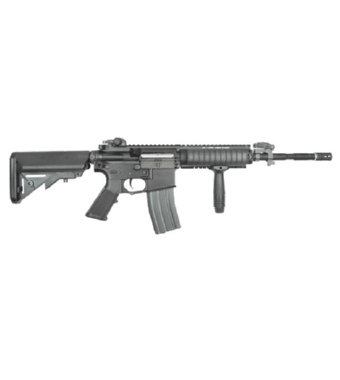 PRODOTTO DALLA KING ARMS, FUCILE ELETTRICO III GENERAZIONE MODELLO SR16 A3 CARBINE FULL METAL. UTILIZZA BATTERIE CQB 9.6V (NON COMPRESE), CARICA BATTERIA 220V 300mA NON COMPRESO. GUSCIO IN METALLO, 5 SLITTE PER IL FISSAGGIO DI ACCESSORI, MANIGLIONE CON TACCA DI MIRA, CALCIO CRANE REGOLABILE (COMPATIBILE BATTERIE LIPO-MINI SDOPPIATE), MIRINI FLIP UP, IMPUGNATURA ANTERIORE, PORTA CINGHIA INTEGRATI NEL GUSCIO, SPEGNIFIAMMA NERO, 2 COPRISLITTE.